The 7.0-magnitude quake struck at 4:53 p.m., centered 10 miles (15 kilometers) west of Port-au-Prince at a depth of just 5 miles (8 kilometers), the U.S. Geological Survey said. 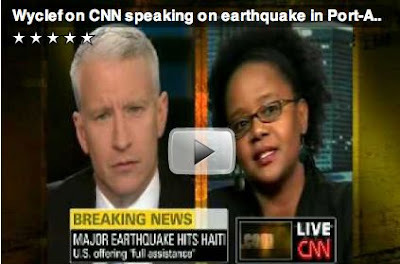 USGS geophysicist Kristin Marano called it the strongest earthquake since 1770 in what is now Haiti. The temblor appeared to have occurred along a strike-slip fault, where one side of a vertical fault slips horizontally past the other, said Tom Jordan, a quake expert at the University of Southern California. The quake's power and proximity to Port-au-Prince likely caused widespread casualties and structural damage, he said. "It's going to be a real killer," he said. Most of Haiti's 9 million people are desperately poor, and after years of political instability the country has no real construction standards. In November 2008, following the collapse of a school in Petionville, the mayor of Port-au-Prince estimated about 60 percent of buildings were shoddily built and unsafe in normal circumstances. Click here to read the entire article. Indianapolis Colt and Haitian-American Pierre Garcon is asking for people to help the condition in Haiti. Visit Pierre Garcon's facebook page here. The Inter-American Development Bank said that it will donate $200,000 in emergency aid to Haiti. Wyclef is also mobilizing efforts to get help for his home country of Haiti. See how you can donate in the image below. Visit www.yele.org for more info. Follow Wyclef on twitter @Wyclef. Direct link to video on You Tube, click here. Dont forget to keep the Haitians in your prayers.